"Adel" means "Noble" and it is our goal to produce German Shepherds that truly represent the Nobility of the German Shepherd Dog in all of its splendor! We breed for correct Conformation, Competition, and Companionship. 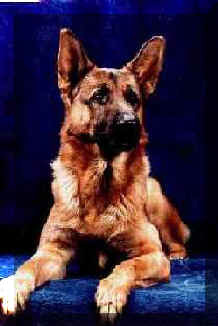 We have had German Shepherds since 1971 and have been breeding and training since 1985. 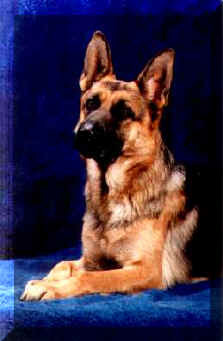 Rhonda is a member of the United Schutzhund Clubs of America (UScA) and the Verein Fur Deutsche Schäferhunde (SV). She is twice a member of the USA's Schutzhund 3 Club and has served as a Breedwarden/ Tattooer for Schutzhund USA. She is a member of Aztec Schutzhund Club. Our German Shepherds are all from excellent German lines, OFA certified hips and elbows, DM tested, health guaranteed, and ready to please. It is our goal that all of our breeding dogs be worked in the sport of Schutzhund. Our puppies are all home grown and raised under the watchful eye of the two legged mother !!! The puppies are well socialized and temperament tested, and vet checked prior to release. Our dogs are also part of our family. So...come look at our four legged family members! She was a dog who loved life, was so willing to please, and was a rabbit hunter extraordinaire!! To see her in full chase of a rabbit was a thing of beauty! Her genuine affection for her people and concern for their well being was beautiful. We recently lost her and know she, Freya, Nolte, AJ and, Gena are all waiting at the Rainbow Bridge! Good-bye my Lady, you are sorely missed!! Nolte was a very special boy. He was the son of the Great Sieger, VA Quando von Arminius, SchH3, FH, IPO3. Sometimes I wondered if he would ever grow up. He never stopped stealing the stuffed animals and he always had this little grin on his face--he knew exactly what he was getting away with. Nolte was a family pack dog--if you were in his family or one of the "chosen" you could do no wrong. Nolte had a great joy of life and loved to be chased by the girls! Nolte was always there for me--he is sadly gone, but NEVER forgotten. If you would like more information about the Adelhertz German Shepherds, our breeding program, training facilities, or Schutzhund Clubs please contact us!